Athanta-based Coca-Cola,the world’s largest soft-drinks company,says it will no longer provide quar-terly or annual earnings estimates, preferring to focus on the real thing. “We are quite comfort-able measuring our progress as we achieve it, instead of focusing on the establishment and attain-ment of public forecasts,” according to Coca-Cola chairman and CEO Dou-glas Daft. Concentrating on short-term profit goals distracts attention from more important long-term business strategies that enhance growth, he says. Analysts may be chal-lenged to produce accurate earnings forecasts without the company’s guidance, but they generally praised Coke’s move, nonetheless. New York-based financial information company Stan-dard & Poor’s said it views the decision as a positive for helping the beverage maker place its full attention on its long-term success. Warren Buffett, one of America’s most successful investors and a Coca-Cola board member, argues that managing for the short term is bad for businesses and shareholders. Hitting earnings targets set by Wall Street analysts can pres-sure executives into doing stupid things, he notes, such as using fraudulent accounting tactics or sell-ing valuable assets. 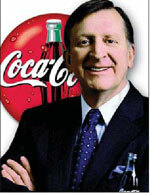 When a company as well known as Coca-Cola stops estimating earnings, others can be expected to follow suit. The company already has shown that it is a trendsetter with its deci-sion last July, ahead of the pack, to treat employee stock options as an expense against earnings. Financial observers say these changes are refresh-ing and are helping to usher in a new corporate culture in America. After a torrid couple of years for Europe’s incumbent telecom companies, are there signs of imminent recovery? It would seem so, if the mid-December actions by rat-ing agency Standard & Poor’s are anything to go by. The agency upgraded KPN of the Netherlands, the first time it has moved a telecom rating up since ballooning debt burdens threatened to over-whelm the sector in 1990. S&P; upped the company’s long-term debt rating to BBB from BBB-, still way shy of the AA rating it held until September 2000. KPN has certainly been on a crash diet, with disposals, cost-cut-ting and slashed capital expenditure slimming net debt to €13.9 billion from a peak of €23.2 billion. KPN made most of the mistakes its rivals did, including woefully overinvesting in 3G licenses. After merger talks with Telefonica failed, only a government-backed €5 billion rights issue in December 2001 saved it from going under. The company is now targeting a debt pile of just €10 billion in the medium term. But it’s not just cost-cutting that has turned KPN around. Under chairman and CEO Ad Scheepbouwer, the company has managed to improve operating performance; fixed-line margins stood at 30% at the end of the third quarter of 2002, up from 26.8% at the same time the preceding year. So does the KPN upgrade signal a turn-around in the fortunes of the European tele-com industry? Partly, according to Gary Jenkins, head of credit research at Barclays Capital in London. He anticipates rating upgrades at BT, Sonera and Telecom Italia. That may help ease the funding logjam, which until recently threatened to paralyze efforts of the European telecom industry to restore health to their balance sheets. In December, France Télécom managed to raise around €3 billion in the bond markets, despite carrying Europe’s heftiest debt burden. Not all Telecom ratings are heading back upwards in Europe. Deutsche Telekom still has to convince rating agencies that its fig-ures are getting better. Austrian technology company Topcall International gave a thumbs-down to Nasdaq Europe last month when it listed on its own domestic exchange in Vienna. The company, which floated on the Brussels-based Nasdaq Europe (then called Easdaq) in 1997, said it was unhappy with liquidity on the Euro-pean tech exchange. It will review whether or not to keep its Nasdaq listing over the next few months. “Topcall’s decision has been influenced by the unsatisfactory market maker system of Nasdaq Europe and the low visibility of the Topcall share on this mar-ketplace both among national and international investors,” the company explained in a statement. “We hope to strengthen our position in our domes-tic market and to create new incen-tives for Austrian investors,” says CEO Herbert Blieberger. nent-wide pools of liquidity that drove growing compa-nies to list on exchanges such as Nasdaq in the late 1990s, and not everyone agrees it’s a wise one. Topcall expects that the Austrian listing will make it easier for retail investors to buy and sell the com-pany’s shares, on account of lower trading charges. Topcall may be small fry, but for an embattled Nas-daq Europe any defection is another blow. GECC is following a growing number of blue chips seeking to woo individual bond buyers. Bond market regulars such as Ford and IBM tapped the market in 2002, through proprietary programs such as InCapital InterNotes, LaSalle’s Direct Access Notes and CoreNotes, run by Merrill Lynch. The notes are designed to be user-friendly, priced at par and bought in lots of $1,000. Above all, for investors battered by bucking stock markets, they offer security. Issuers are lured by the prospects of an alternative to a corporate bond market where spreads have gyrated widely over the past year or so. Institutional investors have put strict caps on the amount of bonds they will buy from any one issuer—event the best quality. 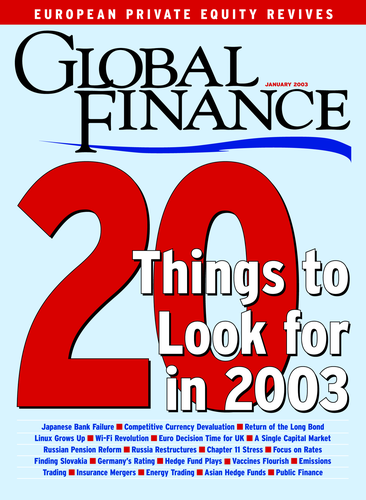 That’s hit frequent users hard; in 2002 GECC raided the bond markets for around $80 billion, a figure that may drop to $500 billion in 2003.GECC was also attracted by the ability to diversify away from commercial paper markets, which at one time accounted for around half of its funding. Many companies found it harder and more expensive to roll over maturing CP last year, as the chill winds of corporate bad news dried liquidity in that market. US CP outstandings almost halved last year. Eager to keep its coveted triple-A rat-ing, GECC reduced gearing in the fall and committed to rein back its dependence on CP. The company may push out up to $10 billion of retail notes in 2003. The notes will be part of a two-yearInterNotes program sold by Chicago-based Incapital and Banc of America Securities. Participants estimate that as much as $70 billion of retail notes may be sold in 2003.